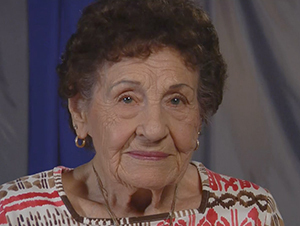 An interview with Madeleine Gilles conducted as part of the Hanford Oral History Project. The Hanford Oral History Project was sponsored by the Mission Support Alliance and the United States Department of Energy. Robert Bauman: My name's Robert Bauman, and I'm conducting an oral history interview with Madeleine Gilles. And this is July 2nd of 2013. The interview's being conducted on the campus of Washington State University Tri-Cities. And I'll be talking with Madeleine Gilles about her family's history, her years growing up in Richland. So let's start with that, if we could. If you could tell me about how and when, why your family came to Richland. Anything about when and why they came here. Bauman: Croatia it looked like. Gilles: Croatia, yes. And my mother was American. Bauman: What were your parents' names? Gilles: Mr. Patricia and John Serdar. Bauman: And did you have any brothers or sisters? Gilles: I had two sisters which are a year and eight or nine months between the three of, you know. Bauman: Mm-hm, okay. And so when you came to Richland, did you have a farm? Gilles: I don't know how he came by a farm, but I know that he had 10 acres on a flat. And my mother's father, my grandfather, lived up on a little hill above us. It's now out at, behind that Richland airport. Bauman: Okay. That's where the land was? Gilles: Yes. It's still fenced off. There's nothing on it. [LAUGHTER] And it was by the irrigation ditch where we lived on the hill part. And the irrigation ditch had that flume across the little bitty gully onto downtown Richland. Bauman: And you used irrigation water on farm? Bauman: What kind of crops did you have? Bauman: [LAUGHTER] And did you have any animals on the farm? Gilles: Horse name. Anyway there's a golf course down there now. Bauman: Where the pastures were? Gilles: Where the pastures were, yeah. Bauman: And so, the alfalfa, was that a crop you grew and sold? Or was that used for your animals? Gilles: Oh, it's to feed the animals in the winter. You cut it and stacked it and put it on a wagon and hauled it over and threw it up on a haystack. [LAUGHTER] One way or another, in the barns, they used to take the horses and somehow off of the hay wagon. They wrapped it up, and then the horses went ahead and drew it up into the loft. That way. Bauman: And so, what other buildings were on your property besides the house itself? Gilles: The barn. And we had a cellar, a ground cellar, and it was covered with dirt and had to open up. Bauman: What was stored in there? Gilles: Oh, canned fruit and things that--sauerkraut in the barrel and anything like that. And then we had where we kept the potatoes and the turnips and all that stuff in another building. And we had chickens. Of course, they harvested the turkeys in the fall. I don't know where they sold them, down to the butcher or somebody. And then we had the barn down the hill farther in front of the haystack, and that was--and there was a barnyard of course. Bauman: Growing up, did you have jobs that were yours on the farm? Gilles: Oh, yes. Worked all day outside and in the sun. [LAUGHTER] Hoeing weeds and picking strawberries early in the morning. We worked for people who had lots of asparagus. We cut asparagus early in the morning. In the spring, you know? And my mother worked in the packing shed, and they packed the asparagus ready for market. Bauman: Was this someone else in Richland? Gilles: I don't know. I think they shipped it. They shipped it in wooden crates. Not too big because they'd get smashed. And the strawberries, the same way. We picked strawberries. We picked apples. We picked pears. We did those kind of things for other people, plus we picked our own fruit so our mother could can them. And we was busy. We had to bring the cows from the pasture home in the morning after cutting asparagus—about 3:00 in the morning, you get up, cut asparagus, bring the cows home and milk them and take them back. Get ready for school. It was busy. Bauman: That's a lot of work. Gilles: Yeah, but it didn't hurt me. Gilles: Oh, yeah. We went down the irrigation ditch down to where it kind of stops down at where there's land and it kind of opened up a little space where kids could come. And we'd go swimming and take a bath [LAUGHTER] with soap. Didn't do much good because you had to run back up the flume home. Gilles: But anyway it was--and well, at school, we did our sports, softball and basketball and went to different little towns for competition games. And see who'd go to Spokane. We went one year, but we lost by--for basketball--lost by one point. Gilles: Yeah, I was in it. Bauman: In the picture, right. Bauman: What position did you play on the basketball team? Bauman: Do you remember any of the other young women who were on the team? Gilles: John Dam’s daughter was. She was forward. And I forget her name, but Margaret somebody was center. And I don't remember them all. Bauman: You must've been a good athlete then. Bauman: Well, there's also in that book, a note that you had won a race. Bauman: How did you get to school? Did you walk to school? A bus? Gilles: No, no. A bus came, and we could see it when we lived on the little hill above the flat surface where we were at first. We could see it. Then we'd take off and run down to the corner and catch the bus. And then he'd pick up all the rest of the kids and go down to Richland. The school was behind John Day and Nelson's mercantile store there. There was a gas station there and a church where we had baccalaureate and all that stuff there from the grade school. And the high school was down the road from the grade school. Richland High. Bauman: Right. Do you remember any of your teachers from? Gilles: Oh, Carmichael and—oh, I don't remember. Bauman: Kids there were. Yeah. Gilles: We had a lot of kids. Bauman: I want go back. You mentioned your parents earlier. And your father was an immigrant from Croatia. Did he speak English? Gilles: Not very well. There was nobody for me to talk to but the animals. [LAUGHTER] Because my mother didn't converse with him. Because she didn't know his language. Bauman: And how had they met? Gilles: Oh, at a dance in Montana--Butte. And he knew her father in the mines. Gilles: Yeah. However, they were advertising at that time for homesteading in the '20s, you know. I was born in 1920. Bauman: Now, did you have electricity at all in your home? Gilles: No. Kerosene light, lamp, and lantern to go to the barn and milk in the winter and stuff like that. Had kerosene. Bauman: And did you have--how did you get from--did you have a car at any time, or was it horse and wagon? Gilles: First of all, it was a wagon with a bed in it. We rode it in the back, and they rode in the front of course. And took a long time to get there, [LAUGHTER] wherever we was going. They belonged to the grange. And we'd go there for their meetings and dances. And my mother played piano, and she played for the drill team and for the dances along with other musicians. And they used to have house parties in the wintertime. They'd clear the floor, and whoever could come to play--and if there was a piano there, my mother played. And they danced or they played cards or--that was their entertainment, so to speak. Go from house to house to play cards. Gilles: Oh, yes. We'd go to the park. What is that park called? Where the golf course is--on the river. Gilles: No, no. It's a golf course on the river. Gilles: Yeah. They'd go along there, and people would come. And they'd make homemade ice cream, and they'd do their wieners or whatever—chicken, it usually was--a lot of fried chicken and pies and cakes, and they had a good time. And then, as I remembered, they used to shoot firecrackers off of the old green bridge and do their fireworks there. So everybody'd go down by the river there and watch them. Bauman: The fireworks there. There was a ferry that would take people across the river. Bauman: Did you do that very often? Take the ferry across the river? Gilles: No, we didn't. But we did go down to the Columbia, down to the boom where they caught wood and trees and stuff and get our wood for the winter, or if you happened to be lucky, get a part of a tree or something. They'd saw it up and have some wood to build something. Bauman: Did you interact with any Native Americans in the area very often? Gilles: Yeah, Arstolds and-- they didn't live close. They had their own acreage and stuff. And we used to go to their house a lot. And Bumgarnters and--gee, I can't think of their names now. Bauman: --in the summer and pretty cold at times in the winter with no electricity. What was that like? Do you have any memories of the heat or the wind or the winter weather? Gilles: Well, we just made do. We had wood for fire. In the cook stove was the heater of the room. We only had two rooms on the hill, and the one house we lived on in the flat was a big one room thing. Gilles: And my grandfather, after he died, we moved up there. And the cook stove kept us warm, but it didn't go all night. [LAUGHTER] You had to get up in the morning and put the kindling in and light it and get it going. And in the summer, you just stopped. And again, in the shade, that's all you could do. And it got really hot because there was no trees. No trees. And now you have green and trees. It makes it cooler. Bauman: Did you get many dust storms? Do you remember many dust storms? Gilles: Oh, yes. Lots of hard sand would blow against your legs when you was going back and forth to the pasture. Ooh. That really stung. Bauman: How about any wild animals? Were there coyotes? Gilles: Oh, coyotes, and rabbits. They used to have rabbit drives. A lot of men would get together so far apart and they'd drive the rabbits in front of them and then shoot them. Because they were a real menace. They get into your garden and eat everything up. Bauman: Yeah, I've heard about those before. Eating the crops were the problem, or the gardens, yeah. So I understand that you had a little bit of an accident. Gilles: Yes, I found a blasting cap that my dad had brought from Butte to blow up the sagebrush. It was big and tough to make more land, you know. And so I found an old one, and I thought it was full of dirt, picked at it and it blew up. Took my fingers off. But I made it. Bauman: How old were you? Bauman: And so did you have to go to a doctor or a hospital? Gilles: Oh, went to Lourdes, and Dr. Spalding took care of my hand. Bauman: And was that the only hospital? Gilles: Only one. And it was 13 miles, and the neighbors that had bought the flat--one room shack--took me over there. It was 13 miles or something. And I had to wait for a baby to be born before they could take care of me. Bauman: How long did you have to stay at the hospital? How long did it take to recover? Gilles: Well, I stayed there longer than I need to do because I didn't have any place to go. My mother and father got a divorce, and she was very ill with arthritis. It's the kind that just comes overnight, and I forget the name of it. But it's a bad one. And so she and I were in the hospital the same time. Gilles: So they kept me there, and then I went to work--for three months they kept me, and I worked folding bandages and stuff before they autoclaved them or sterilized them. And then I worked at the doctor's home for his son--to take care of his baby son. Then I got to go down and eat at their restaurant in the evening. So I was just the daytime stuff, and I stayed there. And I was there till I decided that I needed to go to school and learn to work over. So I went to the Catholic school in Spokane--the House of Good Shepherd it was at that time. And they took wayward girls, but they decided my sisters and I would be a help at the place to do other things. But to mind the rules the same as they had to, which was okay with me. Bauman: So how long were there? Gilles: Oh about two and a half years. My sister Mary was there 13 years, and Rosie was there 10 or so. But they did like Mary. She run the movie machine and helped the nuns. And I worked in the kitchen, and of course I learned to work. And worked in the where we ate in the cafeteria. And I got to go with the nuns when they went soliciting. Bauman: So did you grow up Catholic then? Bauman: Was there a Catholic church in the area anywhere? Gilles: No, we had to come to Kennewick. Gilles: My mother brought a few children, and my sisters over in the summer for us to take our catechism. Bauman: So Kennewick was the place to go? Gilles: Yeah. So we got our proper papers to be a Catholic. Bauman: Do you remember what the name of the church was in Kennewick? Gilles: St. Joseph's as far as I know. That was the first church, and I think it was on—I don’t know--down by the canal. Now I don't know where it is for sure. Gilles: Oh, yes. I know where that one is now, but I don't know where they moved the old church. Yeah, it's on Garfield--the new church, St. Joseph. Bauman: So after you were in Spokane for about two and half years. What happened to you at that point? Where did you go from there? Bauman: Where did you go after you were in Spokane? Gilles: Oh, I worked at a home and took care of invalid fellow and his baby when the family was gone. And I worked in the kitchen and fed the baby and all this. And they rang a bell for me [LAUGHTER] to come and wait on the table and stuff. And then they split up the families. The mother and father and the husband and wife moved out. So then I came out to--where did I go? Oh. I have to think. Where did I go? Oh, I went back to Richland, and I lived with a family that--he worked on the freeways and highways building, and she was home with two or three kids. And so I stayed there. Gilles: And in the summertime, we'd get to go to up in the mountains where they built highways. I forget the name of the one we was that one summer. Anyway. Gilles: Yeah, Drieslers. Jack Driesler, and Nellie. Bauman: And then you said your parents got a divorce around the time you were 16, also. Is that right? Bauman: And so what happened to the family farm when your parents got divorced? Gilles: The government bought it. Gilles: No. I was at 16, and I was born in 1920. So that was what? Bauman: And the government came in '43. So it would've been later. So did both your parents stay in Richland after they got divorced? Gilles: No. He went back to mining up in Metaline Falls where his brother lived. Bauman: And how about your mother? Gilles: She stayed here and married a guy that he lived out there by our school teacher. But when Hanford bought them out, they moved to Prosser and had a mint farm. And then my mother, she died young. She was 53. She died in '55. She had like emphysema and kidney problems. Bauman: You mentioned that your grandfather had some land them on the hill above you. Bauman: Now, did he stay there until '43? Gilles: No. He passed away before we moved up there. So that's how come we moved up there. Some of this is mixed up, I know. But I think it's off. [LAUGHTER] Been a long time ago. Bauman: Is there anything that I haven't asked you about, any--either events that really stand out in your mind or really special memories or anything like that I haven't asked you about that you'd like to talk about? Gilles: Not that I can think of at the moment. Gilles: We were raised together. Off-camera man: --chucking cow patties at her and stuff like that. Bauman: So a little sibling rivalry? Gilles: Oh, she wanted to boss everything. [LAUGHTER] When she hears that, she'll--she's still alive. And Rosie wasn't going to have that. Bauman: And Rosie was the youngest. Gilles: Yeah. She was feisty. She passed away. Bauman: And all three of you were in Spokane for a while. Bauman: So what happened--your sisters, when they left Spokane, where did they go? Gilles: Rosie went with my cousin Tony to Waukegan, Illinois and got a job there where they made pills-- filled pills. I don't know what you call it. But anyway, she got a job there and lived there about five years and came back out and met her husband out at the area. He was a--he drew--what do you call it? Gilles: Draftsman. And she was a secretary. And they met and married and moved back to Wenatchee where he was from, up there. And lived till they both passed away. Mary is still here with her husband Jim. Gilles: Oh, I was up in Seattle working at the Swedish hospital. And for a while, I worked at the Bon Marche, downtown Seattle and helped the baker in the morning and cleaned the steam table. They had a little restaurant at that time, the Bon Marche did. I helped the baker make pies and cakes and stuff. Bauman: And when did you come back to Richland or to the Tri-Cities? Gilles: 1986. 50 years later. Bauman: I was wondering what you would think would be important for people to understand about the community of Richland that you grew up in? To understand sort of what it was like to grow up there. Gilles: I think it was a great life. And children worked and there wasn't so much vandalism. And of course, there wasn't that many people, but they were good people. I can't really think of anything. Bauman: Well, thank you very much for coming in here. Bauman: This was terrific. Some really good stories and memories, and I really appreciate you being willing to come and talk with us. Gilles: There's probably a lot more, but I'm sorry I don't remember it all. Bauman: Well, what you remembered is great. Thank you very much. Bauman: It wasn’t too bad, was it? Gilles: No, I just wish I knew more. Man: You did a terrific job, I’m proud of you. You obviously knew a ton of it. Camera man: Can I take a picture before you go? Bauman: It’ll go along with your information. Man: When we put together all the stuff. Gilles: I hope it’s a good one! I don’t take good pictures anymore. Man: Oh, well, we all say that. 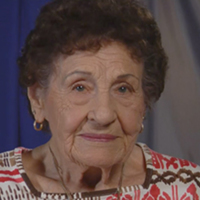 Hanford Oral History Project at Washington State University Tri-Cities, “Interview with Madeleine Gilles,” Hanford History Project, accessed April 22, 2019, http://www.hanfordhistory.com/items/show/68.